Fancy Foam Models Pull - Pull control system. 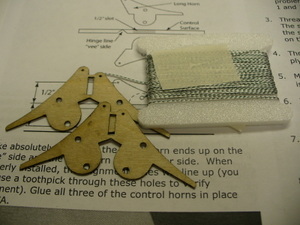 Comes with printed instructions, 12' of "zero stretch" string and two sets of laser cut control horns. Enough hardware to rig the elevator and rudder on almost any foamy. This kit is for 3mm foam planes only.